LED lights have become increasingly popular as energy efficient lighting solutions, significantly reducing the amount of energy a household consumes to cutting costs of electricity usage. In the modern era, new technology has been developed that now integrates ceiling fans with LED lighting. Ceiling Fans have taken a large step in the right direction as we find that many Ceiling Fans now come included with an LED light or the option of purchasing an LED light as an accessory to fit with the Ceiling Fan. There are an endless amount of options and we will take a look at Ceiling Fans with LED lights that are compatible with dimmable remote controls. Dimmable remote controls give you greater control, adding a layer of versatility into the household. When previously installing a ceiling fan with a light, the choices were limited to only switch the light on or off. Today we now use a dimmable remote control giving the user a favourable experience reducing or maximising the amount of electricity output of an LED light. It positively benefits a domestic environment by saving energy and extending the lifecycle of the LED globes or lamps. In turn dimmable remote controls can be programmed throughout the day or night to perform at an optimum level of light used in a room or space. Ceiling Fans Warehouse has many dimmable remote control choices at our disposal with the two most popular options including the Fansync Bluetooth Remote Control and the Fanco Dimmable Remote Control. The Fansync Remote Control functions via Bluetooth technology packaged together with selected Three Sixty ceiling fans enabling you to endure a seamless experience indoors. 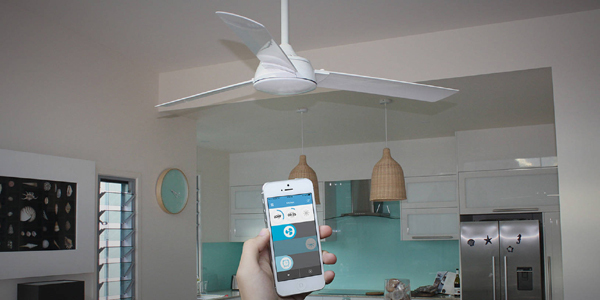 This Bluetooth remote control is infinite and once synced with selected Three Sixty Ceiling Fans such as the Spinstar or Modn-3 the remote control connects simultaneously to multiple Ceiling Fans in designated rooms all from the one smartphone device. Compatible with a diverse range of IPhone and Android devices, the Fansync Remote Control uses dimming support to lower the percentage of light by the simplicity of your fingertips. This allows you to control the level of light you wish to set in one or multiple rooms. With the Bluetooth remote controls advanced technology it enables a living space to be transformed into the ultimate cinema experience for example by using an automatic timer to dictate the fans speed to low, medium or high, and the degree of lighting which best suits the needs of the living space. The DC motor Urban 2 with LED light is another option that can be dimmed via the remote control. Packed with features the Urban 2 is equipped with a 3000k warm white LED light, its low colour temperature of light suits a multitude of bedroom settings, a perfect choice for warm white lighting. This top rated ceiling fan is eco-friendly and comes equipped with a dimmable remote control. It performs at its optimum in three stages; the first step is best performed needing the full degree of light in your bedroom space. The second step for the 24w LED light will switch initially to 50% of lighting, typical settings which would need this level of light exposed include spending the night reading a book. The third and final step switches the light to 15% of its full capabilities, the dimmable remote control would be ideal for using the light at this percentage whilst watching television before bedtime. The Urban 2 can be programmed for up to 8 hours to set the degree of lighting for your requirements and is an excellent option to be used as a bedroom fan with its soothing DC motor that performs at a low noise levels whilst being an extremely energy efficient fan. Ceiling Fans are forever changing and as technology evolves so does the accessories and light options available. A dimmable LED option is a great choice if you are looking to change the levels of brightness; they are well suited for installation in a bedroom. To view all of our dimmable LED light ceiling packages click here.